Shortly after passage of the Social Security Act of 1935, government planners started looking for a building to house the new program. 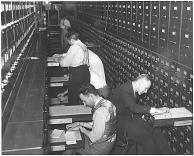 The Social Security program required the government to keep large quantities of paper records, issue Social Security numbers and document the earnings history of 26 million workers in order to compute their future benefits. It was described by the newspapers of the day as “the largest bookkeeping operation in the history of the world.” When the engineers calculated how much all this paper, filing cabinets and equipment might weigh, they discovered there was no building available. In desperation, Frank Bane, the Executive Director of the Social Security Board, went to the White House for help. President Roosevelt gave permission for Social Security operations to move into the recently vacated old Interior building in Washington, D.C. But before Social Security could get up and running, the Director of the Public Works Administration and his staff moved into the building. Social Security was again searching Washington for another suitable building, but nothing could be found. Then Bane heard about the Candler Building on Baltimore’s harbor. It was the best available option. So in October 1936, Social Security moved into the building, with plans to stay for six months or so. Soon after settling into the Candler Building, construction began in D.C on a custom-designed building to be built to Social Security’s specifications. Social Security’s intention was to relocate to the new Washington site as soon as it was complete in early 1941. But then another twist of history – World War II – came into play. By the time the new building was ready, the United States was already mobilizing in response to the war in Europe and Asia. The new Social Security building was given to the War Department instead. After the war, the disruption that would be caused by Social Security relocating was judged too great, so Social Security stayed in Baltimore, in the Candler Building. Then, in 1960, a new facility was finally built in Woodlawn, a suburb of Baltimore. Social Security’s six-month stay in the Candler Building ended up being 24 years, making the Candler Building the first operational headquarters of the U.S. Social Security system. Social Security took possession of its space in the Candler Building in October 1936. As the new Social Security system was to take effect on January 1, 1937, Social Security immediately began a frenzied recruitment and hiring blitz. The first 18 production employees reported for work on November 9, 1936. On one day alone in December 1936, Social Security enrolled 940 new employees onto its Candler Building staff. By the end of December, there were over 2,500 employees on duty. The initial recruiting and hiring blitz was a nationwide effort as civil service regulations of the time mandated that each state have a proportional share of Depression-era government hiring. During World War II, Social Security actively recruited young women from around the country to move to Baltimore to work in the Candler Building. The agency even provided housing services by contracting with local landlords to operate dormitory-style rooming houses exclusively for Social Security’s female workers. When Social Security moved out of the Candler Building in January 1960, there were about 5,300 Social Security employees working onsite. During the 24 years that Social Security was housed in the Candler Building, the agency issued 132 million new Social Security numbers, posted over 3.7 billion wage items to individual records and paid out about $51 billion in benefits. Social Security was the major tenant of the Candler Building during its 24 years, occupying all or part of six of its 12 floors. Housed within those floors were millions of applications for Social Security numbers and the earnings record of every person participating in the Social Security program. These earnings records were constructed from quarterly reports from the nation’s employers. The reports listed all employees of the company, their Social Security numbers and how much they were paid during the previous quarter. Social Security employees then posted these reports to each person’s individual earnings record. When people filed for benefits, their benefit amounts were computed based on these earnings records using mechanical adding machines. To process this work, Social Security employees used what was then state-of-the-art electro-mechanical tabulating equipment. 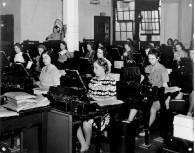 In fact, IBM designed some of its early office equipment specifically to suit Social Security operations. Engineers from IBM were often onsite designing new equipment. In early 1956, Social Security installed its first modern computer, an IBM 705 mainframe, which was used to calculate benefit amounts electronically. IBM often used Social Security and its operations in the Candler Building as a testing-ground for this early generation of business computers. Social Security has been headquartered in Woodlawn, Md. since 1960. There are currently more than 6,300 employees at its Woodlawn headquarters complex with a total of 11,500 in the Baltimore/Woodlawn area, 12,000 in the state. Social Security is the third largest non-state or local government employer in Maryland. Last year Social Security issued over 18 million new and replacement Social Security cards, processed 260 million annual earnings reports and paid out more than $457 billion in Social Security benefits. The Candler Building was constructed in 1912 by the Coca-Cola Corporation to serve as a bottling factory, warehouse and commercial space. One of the first tenants besides Coca-Cola was the Burrough Brothers drug company of Baltimore. Originally named the “Coca-Cola Building,” it was renamed the Candler Building, in honor of Coca-Cola founder Asa Candler. 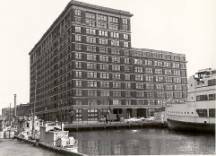 In the 1920s and 1930s, the Candler Building was at the center of a busy working port, with steamships docking at the piers across the street, and with the Fish Market and the Farmers’ Market located nearby on Market Place. Many different firms occupied space in the Candler Building before Social Security took up residence there. During the 1920s and early ’30s, Firestone Tire and Rubber, the Parke-Davis company and the U.S. Woolen Mills were tenants. A company that made straw hats was one of the largest tenants. And just before the end of Prohibition, enterprising businessmen stocked the building with thousands of barrels of whiskey, anticipating an imminent market. At one time, the B&O Railroad tracks ran right into the middle of the building, with a siding for six cars, so that freight could be more easily shipped.